HG Book-Tour Details Revealed, and Keeping Coffee Guilt-Free! 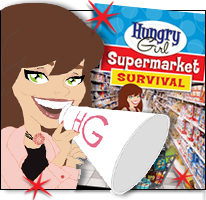 A week or so ago, you posted on Facebook about an upcoming tour for your Supermarket Survival book. I NEED details! I've never been to an HG book-signing event but heard they're a lot of fun. Can't wait to get my hands on the new book! Wednesday, 10/12 - Manhattan, NY! Monday, 10/17 - Cherry Hill, NJ! Wednesday, 10/19 - Cincinnati, OH! Friday, 10/21 - Chicago, IL! Tuesday, 10/25 - San Antonio, TX! Wednesday, 10/26 - Austin, TX! Friday, 10/28 - Seattle, WA! Wednesday, 11/2 - Portland, OR! Thursday, 11/10 - Los Angeles, CA! Tuesday, 11/15 - Riverside, CA! I'm a longtime fan, but this is the first time I've submitted a question. I love, Love, LOVE coffee. Sometimes I work long hours and drink multiple cups a day. I prefer my coffee sweet and light. Do you have any suggestions for sweeteners and creamers so that I don't end up drinking too many calories? Thanks so much! If you like milk in your coffee, the fat-free kind isn't necessarily your best bet. 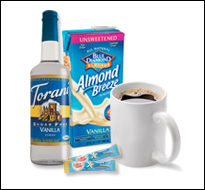 Unsweetened vanilla almond milk or light vanilla soymilk is a better choice -- each of these has fewer calories and way more flavor than fat-free milk. Unsweetened Vanilla Almond Breeze is my absolute favorite. If you're a fan of creamer, stock up on the sugar-free and fat-free powdered creamers from Coffee-mate, especially the flavored ones. The powders are better than liquid creamers because there's less risk of an over-pour (which is how the calories really rack up). Click here for more about these. And if you need something portable, check out Coffee-mate's packets of powdered creamer -- the French Vanilla isn't super-low in calories (60 per packet), but it's portion-controlled and great on the go. If you like a serious flavor boost, get some Torani Sugar Free Syrups. There are dozens of calorie-free flavors -- from holiday-ish ones (like Peppermint and Pumpkin Pie) to everyday favorites (French Vanilla, Caramel, Coconut, etc.). And a little goes a long way. You can order 'em online, and they're also at select specialty stores like Cost Plus World Market. If you're grabbing coffee while out and about, ask the person behind the counter if the place has sugar-free syrups like these -- usually, coffee chains carry one or two flavors. As for sweeteners, stick with packets of no-calorie sweetener. Truvia, Splenda, PureVia... whatever you like. BTW, each packet of "zero-calorie" sweetener actually has about 4 calories. Still better than the 15 or so in each packet of sugar. Other awesome add-ins? Unsweetened cocoa powder and 25-calorie hot cocoa mix packets (like Swiss Miss Diet) -- these add choco-rific flavor for hardly any calories. Hope all of this info helps, and keep the questions coming!